Latest Design Option 6, Photo 4 » Roger Perron Inc. Here is a view from the family room, showing the dining room and living room. The decorative glass in the foreground is hand-etched, which provides a beautiful separation as well as an open feeling. 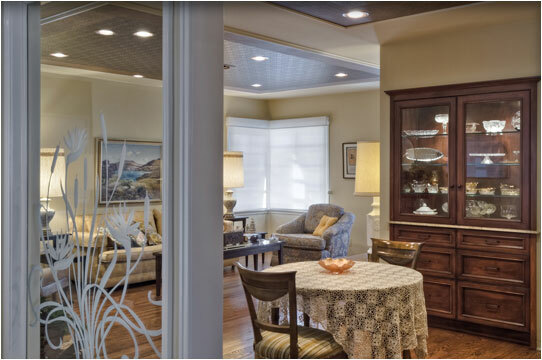 The 1’’ drop ceilings are decorated with wallpaper, setting the dining room apart from the living room. The built-in hutch with lighting shows off the owners’ heirlooms, while hardwood flooring adds to the ambience.